Resources Social Media Webinars Online • Promote the Legacy of Civil Disobedience! 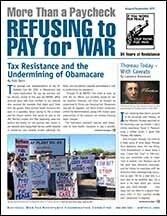 The passage and implementation of the Affordable Care Act (ACA, or Obamacare) had many implications for war tax resisters and tax refusers. During its first year the NWTRCC office received many calls from nonfilers in our network who resented the mandate that might push them into the system. Many wanted health insurance but were in a quandary about having to file a return and the insurer reports that would be sent to the IRS. Married couples who filed separately could not receive the credits. On the positive side, others in our network were happy that the tax credits lowered or zeroed-out their taxable income (although the forms and calculations required precipitated a rush to professional tax preparers). 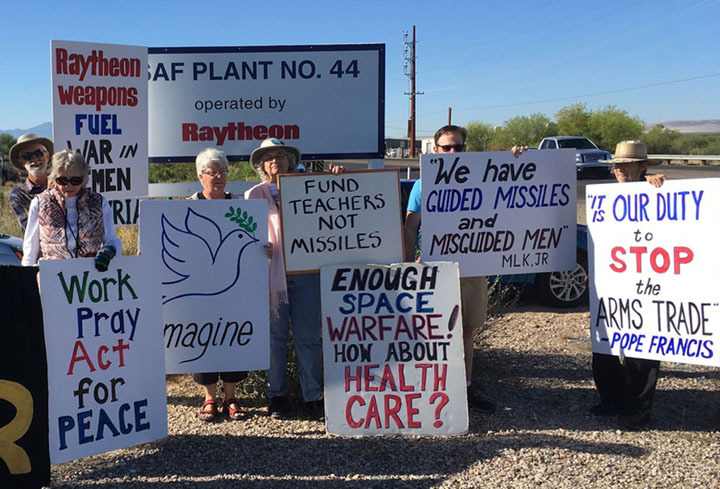 Tax day demonstration at the Raytheon plant in Tucson, Arizona. Photo by Felice Cohen-Joppa, April 18, 2017. Through it all NWTRCC has tried to keep up with the tax effects and resulting tangle for war tax resisters. However, just when we thought we understood it, things are changing fast. Obamacare may yet be repealed, but lesser known maneuvers within the Administration, along with Trump’s open undermining of the program, are already bringing major changes. The “individual mandate” requires most Americans to have health insurance or pay a penalty. A provision drafted by the House Committee on Appropriations would stop the IRS from enforcing the penalty for individuals who are not covered (section 5000A of the Internal Revenue Code). This Appropriations provision would also prevent the IRS from enforcing requirements that employers and insurance companies provide names and Social Security numbers of people covered under their policies. Without those reports it’s not really possible to enforce the individual mandate. In addition, one of Trump’s actions on his first day in office was to tell agencies to use their discretion in granting exemptions to fees and penalties, which in turn caused the IRS to reverse course and accept tax returns even if they did not include information about health coverage. And then there’s the proposed budget, which calls for drastic cuts to Medicaid, including disability payments, and the money that subsidizes ACA tax credits. So if you were wondering if you have to pay the “lack-of-coverage penalty” or that your name and information will be shared with the IRS by an employer, you can probably scratch those worries off your list. But we can’t scratch off the worry about the cost of health care and the crime of cutting off services for those most in need. Now more than ever, demand cuts to the military and health care for all! It looks like NWTRCC’s Practical #7 “Health Care, Income Security and War Tax Resistance” will need some updating soon. Comments to the NWTRCC office from your own experience with health care are always helpful — and needed now more than ever! I was moved by Dave Gross’s account of his encounter with Thoreau, of the influence Thoreau exercised on his becoming a war tax resister. I had a similar experience, found in Thoreau’s essay a similar power. I agree that Thoreau still matters. For another, the essay is anti-democratic. We know from Thoreau’s other writings how contemptuous he was of people who didn’t by his standards live good lives. Among them were the Irish immigrants he describes, and of whom he says, in Walden, that “the culture of an Irishman is an enterprise to be undertaken with a sort of moral bog hoe.” Civil Disobedience states Thoreau’s elitist position more directly: “any man more right than his neighbors, constitutes a majority of one already.” The person who is “more right” can only be a majority of one if the neighbors’ votes aren’t counted. How does that square with democratic principles, in an age when it matters so much to people on the left that people get to vote and have their votes matter? A colleague of mine once described Thoreau’s politics as being “to the right of Genghis Khan.” That doesn’t seem right either; but his politics were, I think, sexist and elitist, and in my view at any rate, to hold on to what remains powerful in him, we have to acknowledge what his limits were. Lawrence Rosenwald is a member of New England War Tax Resistance and Professor of English and of Peace and Justice Studies, Wellesley College in Massachustts. As a longtime war tax resister with something over $18,000 “taxes due” being demanded from me by the IRS, I had a little qualm about needing to renew my passport. When the time came in June, I sent it in with the renewal application and money order payment but didn’t order a rush turn-around. This inspired a friend to add an additional worry by asking, “But what if you need to get out of the country fast?” I didn’t have to stress for long. Within a month my new passport arrived in the mail, followed by my old one (cancelled) a few days later. Please keep us updated on your experiences — and especially any problems related to your passport and war tax resistance. Tax scams continue. Now the cybercriminals are not only targeting individuals, but they are going after tax professionals. The IRS recently launched a campaign called “Don’t Take the Bait,” which warns tax professions to be wary of emails asking them to click on a link or open an attachment, even when it seems to come from a known source, such as a familiar bank or a colleague. The number of liens filed, levies made, and property seizures performed by the IRS all dropped again last year, following a several-year trend. The agency is beset by lower budgets and greater responsibilities and has had to trim its enforcement activity. You can see charts showing the ups and downs at sniggle.net/TPL/index5.php?entry=02Apr17. The number of Americans renouncing their citizenship hit an all-time high in 2016 (up 26% from 2015). Not only that, but this is after the government jacked up the cost, from a $450 fee to renounce and no fee to relinquish to a $2,350 fee either way. The State Department said raising the fee was about demand and paperwork, but the number of American expatriations still increased after the fee hike. In an effort to force users of bitcoin to report their income, the IRS demanded that one company selling bitcoin provide the IRS with detailed data and account information on all of their customers. When the company refused, the IRS sued but then backed down and changed their approach to demanding the information only for those with total transactions over $20,000. Whether the company will comply is still open, but this is an ongoing battle on the part of the IRS to force compliance to the “voluntary” tax system in the digital age.Additionally, an article by Laura Saunders in the Wall Street Journal, noted that many online sellers and workers in the gig economy fall into an income-reporting shadow. Under a law enacted in 2008 and later clarified by the IRS, many online-platform businesses that take credit-card payments, such as Airbnb, Etsy and ride-sharing firms, fall into a special category. They have to report a provider’s income to the IRS only if that person earns more than $20,000 and has more than 200 transactions; then the company sends both the provider and IRS a Form 1099-K listing gross income. By contrast, freelance workers who don’t use online platforms often face a much stiffer reporting threshold of $600 for Form 1099-MISC. The IRS has launched a “view your tax account” service, irs.gov/uac/view-your-tax-account. If you’re a resister and want to keep an eye on how much money they’re after you for, this is a convenient way to do it. This service supplements the agency’s “Get Transcript” service, with which you can get more detailed information about your account, your past filings, IRS actions taken with regards to your account, and what the agency knows about your income sources. The Treasury Inspector General for Tax Administration looked at the IRS backlog of unpaid tax accounts and found hundreds in which penalties and interest had been incorrectly calculated by the agency. You might want to check your account transcripts and double-check the IRS’s numbers. — Thanks for contributions to Bits and Pieces from David Gross, whose blog The Picket Line, sniggle.net/TPL, includes more on these topics. Contributions tend to dry up during the summer months, so we are grateful to all of you who responded to our May fund appeal or just sent a donation of any size recently! The Network List of Affiliates, Area Contacts, Counselors, and Alternative Funds is updated and online at nwtrcc.org, or contact the NWTRCC office (nwtrcc@nwtrcc.org or (800) 269-7464) if you would like a printed list by mail. Correction: In the last issue, Andrew Newman wrote about his experience after an article in The Guardian featured his new interest in tax resistance. While he mentioned that it seemed only a couple people were willing to be public, Jay Sordean wrote to say he was interviewed (willingly) for the same article but not quoted. This may be the case for others also. A recent tally of Spanish war tax resisters says that last year about 500 people redirected 57,500 to 88 alternative projects, the most popular of which was Stop Mare Mortum, which assists international migrants and refugees. They also have a graphic that echoes one of our slogans (or we may echo theirs): “Desarm tus impuestos,” disarm your taxes. You can read more about Spanish military spending and the resistance effort at todoporhacer.org/no-pagues-guerras-la-objecion-fiscal-al-gasto-militar or on the group’s website, nodo50.org/objecionfiscal (in Spanish, or use an online translator). Members from the German group Netzwerk Friedenssteuer reported on their blog, blog.friedenssteuer.de, about the June 23-25 General Assembly of the members of CPTI. Fourteen participants from six countries were in attendance as the group met to strengthen their board of directors and carry on work at the UN in Geneva. CPTI is still recovering from its move to England a few years ago and the deaths of some key officers. 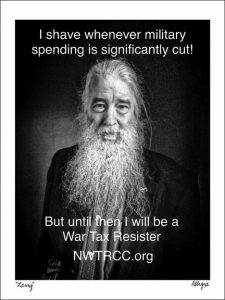 NWTRCC is not a member of CPTI at this point, but we stay in touch and will hope to see many if another war tax resistance/peace tax campaign international conference gets organized. The most exciting group these days seems to be Conscience UK, based in London and online at conscienceonline.org.uk. They reported on their “fantastic year” having “had a Peace Tax Bill read in Parliament; received the public endorsement of Oscar-winning actors Sir Mark Rylance and Emma Thompson; enjoyed collaborations with the Campaign for Nuclear Disarmament, Campaign Against The Arms Trade, the Stop the War Coalition and many other excellent peace organisations.” Perhaps most exciting is that Conscience supporter, Jeremy Corbyn MP, is the head of the Labour Party and has new young support that gives him a chance at being prime minister one day. For more information or to connect with other groups outside the U.S. see cpti.ws. Some years back NWTRCC added our name to an effort coming out of Australia called The People’s Charter to Create a Nonviolent World. A few updates were sent out recently, and it’s high time we made mention of the project again. Right now signers include 109 organizations/networks from 35 countries, plus individuals from a total of 101 countries. The most recent signers are from Azerbaijan, Paraguay, Vietnam, Iran, and Venezuela. The latest progress report article, “International Collaboration to End Violence,” was published online by a number of outlets in 14 countries, and a recent email included a long list of interesting stories, quotes, and descriptions of nonviolent actions from many of the signers. You can read the Charter and check out the latest news and articles at thepeoplesnonviolencecharter.wordpress.com. Judy Scheckel and Steve Magin were among the veteran war tax resisters and allies gathered for a potluck and informal meeting in Celo, North Carolina, at Jim Stockwell’s Common Ground farmstead. The Fools of Conscience are always out on tax day and get together occasionally at other times during the year. Photo courtesy of Clare Hanrahan. The National Campaign for Nonviolent Resistance held an action on the U.S. Capitol steps July 12, Henry David Thoreau’s birthday. Six members were arrested as they stood in “bloody” tee shirts holding a “Stop the War Machine: Export Peace” banner. They read a petition pleading for an end to war funding. Among those practicing civil disobedience on Thoreau’s birthday were a number of war tax resisters or WTR supporters, including Baltimore activist Max Obuszewski; Malachy Kilbride, the relatively new executive director of the National Campaign for a Peace Tax Fund; Alice Sutter, a longtime activist and war tax resister in New York City; and Phil Runkel, a NWTRCC supporter who hosted many of us at the Marquette University Library and Special Collections archives, where his specialty is overseeing the papers of Catholic Worker and Dorothy Day. Our WeCopWatch friends Jacob Crawford (left) and David Whitt (right) were featured in a New York Times photo-essay “Hand-Held Journalism in Harrowing Times” by Cara Buckley. The essay presented four new documentaries about on-the-ground journalists in Syria, Cambodia, with the Islamic State, and those who monitor police in the U.S. The new documentary, Copwatch, takes you to on-the-street trainings with David, Jacob, and others. Jacob says to NWTRCC: “Let your community know if they ever want on the ground support, we will gladly come out to where you are, train, and teach folks in the streets how to copwatch.” See their website at wecopwatch.org, or email the group at wecopwatch@gmail.com.” The photo here is from their recent Dakotas Multi-Reservation Tour, with Sophia Wilansky, who had her arm ripped in half by an explosive thrown at her by police on November 20 at Standing Rock. Photo courtesy of WeCopWatch. My name is Ronald Brooks. I am currently incarcerated at the Louisiana State Penitentiary at Angola, Louisiana. I am writing to you all because I believe you all are God-sent and are sincere in your efforts and work against systemic oppression levied against racial minorities and poor people. I am also writing because I am inspired by your commitment to redirect your tax dollars to black, brown, and indigenous people’s freedom and liberation movements. The stand you guys are taking is historic, heroic, and a blessing to humanity. Being the founder of Decarcerate Louisiana and its number one supporter, an organization that advocates for the redirection of tax dollars from law enforcement and the prison system into community reinvestment, and the overhaul of our penal and criminal justice systems, it is fitting that I write to you all seeking friendship and connection for mutual support. We can use some help from you all with fundraising, typing up documents, passing out flyers and brochures, volunteering with hosting our organization’s social media pages, etc. (decarceratelouisiana.com, facebook.com/DecarerateLouisiana, twitter.com/DecarerateLA), we are a social change organization. We are going to need more help to build our movement. 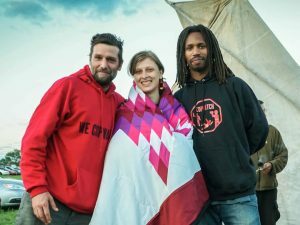 We welcome your support and hope that we can share, build, and grow together and become the free and liberated women and men we were all created to be. Erica Weiland, David Gross, Chrissy Kirchhoefer, Sarah Mueller, Ruth Benn, and all you war tax resisters we salute you and wish you love, strength, and power going forward. Ronald received a recent copy of this newsletter from Sam. Ask the NWTRCC office for Ronald’s mailing address. We are happy to send prisoners our newsletter at no charge. Send name and full address to the NWTRCC office. Don Kaufman at a NWTRCC meeting in 2009. Photo by Ray Gingrich. 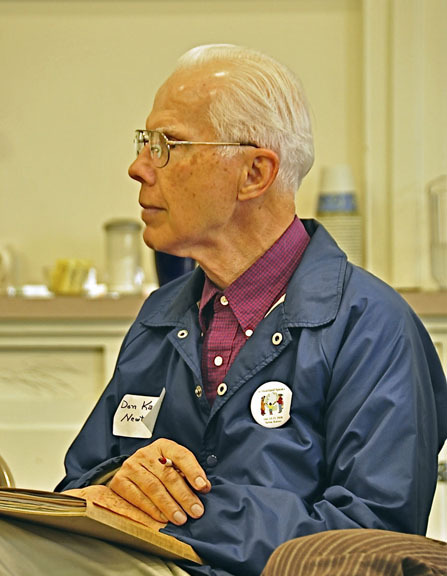 Newton, Kansas, resident and member of Heartland Peace Tax Group Donald D. Kaufman donated 14 boxes of documents collected during his peace activist life. Two smaller boxes are distinguished by documents related to persons selected because of their persistence in accepting and promoting the goal of “Redirecting War Taxes” under any type of government. Two of the larger boxes contain books and newsletters that are pertinent to this research. Don also prepared a 59-page bibliography that is relevant to understanding the aspirations and hopes of the nonviolent war tax resistance movement. Don graduated from Mennonite seminaries, and he and his wife Eleanor worked in Indonesia for the Mennonite Central Committee during the 1960s. He is the author of two books: What Belongs to Caesar? (1969) and The Tax Dilemma: Praying for Peace, Paying for War (1978). You can find his papers as Collection #MS 663 at Bethel College and the Mennonite Library and Archives in North Newton, Kansas. 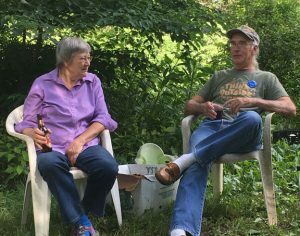 Judy Scheckel and Steve Magin were among the veteran war tax resisters and allies gathered for a potluck and informal meeting in Celo, North Carolina, at Jim Stockwell’s Common Ground farmstead. The Fools of Conscience are always out on tax day and get together occasionally at other times during the year. Photo courtesy of Clare Hanrahan. Our WeCopWatch friends Jacob Crawford (left) and David Whitt (right) were featured in a New York Times photo-essay “Hand-Held Journalism in Harrowing Times” by Cara Buckley. The essay presented four new documentaries about on-the-ground journalists in Syria, Cambodia, with the Islamic State, and those who monitor police in the U.S. The new documentary, Copwatch, takes you to on-the-street trainings with David, Jacob, and others. Jacob says to NWTRCC: “Let your community know if they ever want on the ground support, we will gladly come out to where you are, train, and teach folks in the streets how to copwatch.” See their website at wecopwatch.org, or email the group at wecopwatch@gmail.com.” The photo here is from their recent Dakotas Multi-Reservation Tour, with Sophia Wilansky, who had her arm ripped in half by an explosive thrown at her by police on November 20 at Standing Rock. After watching, be sure to follow twitter.com/wartaxresister on Twitter and Like facebook.com/nwtrcc, and retweet/reply to/share our messages! You can also find more NWTRCC videos at youtube.com/user/nwtrcc, including the excellent talk by Matthew Hoh at the St. Louis gathering in May and the WTR 101 webinars by David Gross and Erica Weiland. Share them with your contacts too! Promote the Legacy of Civil Disobedience! Too many events related to the Thoreau Bicentennial focus on Walden and nature and ignore the political side of his life. It’s up to us to keep it alive! Teachers (and everyone) take note of these resources available from NWTRCC. Start by looking at our special bicentennial webpage for links to relevant articles and resources online: nwtrcc.org/henry-david-thoreau-bicentennial. “Don’t Pay War Taxes” — 1¾” button with Thoreau image. $1.50 each. We are excited to announce that the fall NWTRCC National Gathering will join with the annual New England Gathering of War Tax Resisters and Supporters at UMASS-Amherst. Tentatively titled “Voices of Resistance,” the program is in formation, but it looks like it will include a panel discussion of student activists as well as time for war tax resisters to share their stories from decades of experience. This weekend of workshops and discussions will highlight our collective power over many years of activism. The Friday night and Saturday programs will take place at the University of Massachusetts in Amherst, but the weekend begins with registration and dinner on Friday at Pioneer Valley Cohousing, 120 Pulpit Hill Road in Amherst. Delicious meals will be provided by Pacifeast caterers Joanne Sheehan and Rick Gaumer. If you are planning your flights to come to the gathering, the closest airport is Bradley International Airport (BDL). Amtrak (the Vermonter or some Northeast regional lines) stops in Northampton (closest) or Springfield, Massachusetts, plus Greyhound (and maybe other buses) serve Amherst Center and UMASS. Watch our website for more details or ask the office for a brochure. We look forward to seeing you there. Becker (NWTRCC assistant and WRL temp worker), Emma Burke, Tara Tabassi, Ali Issa, and Linda Thurston in the WRL offices. NWTRCC’s Field Organizer Sam Koplinka-Loehr is on-the-road as you read this, headed to a house-meeting talk in Western Pennsylvania on August 1, and then to Minneapolis/St. Paul for World Beyond War’s Democracy Convention where Sam will be on the “Building Local Power for Peace” panel Friday, August 4 at 1 pm. That evening Sam will lead a public workshop, “Towards Justice Together! War Tax Resistance & Organizing Against Racist State Violence” Workshop, with local activists at Twin Cities Friends Meeting, 1725 Grand Avenue in St Paul from 7-9 pm. Next stop Toronto, Canada, for the conference Solidarity & Fightback: Building Resistance to US Militarism August 6-7, followed by a swing through upstate New York for meetings with individuals and groups. Contact Sam at 607-592-7650 for other possible stops and updates. Thanks to Ed and David! he accomplished the mighty task of shifting the list to a new server on Riseup.net. Recently Ed announced that he was ready to step down from the oversight role, and California WTR and tech expert David Gross agreed to step up. The list operates independently of NWTRCC, but our role in networking comes in handy for such transitions. Thanks to Ed for his years of behind-the-scenes volunteering and to David for taking on another volunteer task! You can join the discussion at lists.riseup.net/www/info/wtr-s or from the black and red star at nwtrcc.org. I have happily just passed the ten-month mark of my first year of massive resistance. I mark this new beginning of my life on June 11, 2016, with the death of my father and with my commitment to redirect much of my inheritance to make a better world. Dad left me $1 million with instructions to distribute about half of it to grandchildren and great-grandchildren and special others. I did that and set to work on my half. My commitment to civil disobedience in honor of my mother, who became a criminal for peace in her later years, is acted out in my case with war tax resistance. I am resisting the $128,005 I owe in federal income tax for 2016, because nearly 50% of anything I do pay will go for war or preparation for war. I cannot in good conscience pay for war. I have donated more than that amount to meet human needs internationally and nationally and locally. To honor my father and mother I am trying to do as they did many times in their lives in trying to directly help the less fortunate. They were brave and compassionate by giving money and offering a place to stay in their home and loaning other personal goods. They found that helping others was not always free of risk. People who were ill and without resources sometimes took advantage of them. But my parents knew that they had much and others had little. Since I live in the internet age I have had a much broader range of people in need. While I have given to many charities I have also tried in a very small way to help some individuals in Haiti and Kenya and Uganda who had little compared to me who had been left with so much by my father. My effort with individuals has taught me a lot about the desperation of poverty. I have often remembered my first job out of college working with the poor in Pontiac, Michigan. Back then I came to the conclusion that what the poor need most is money. So when I found the international charity GiveDirectly that gives cash to the extremely impoverished in East Africa, I knew I had found an organization that I wanted to support significantly. I have done that in the past year as well as supporting many other charitable organizations. I do not know what the justice system will do when I refuse to pay my federal taxes in April. I am a little bit scared of what they might do, just as I was scared in 1985 when they took me to court. But sometimes as my parents knew and as they taught me by their example you have to do what you have to do because it is clearly and conscientiously the right thing to do. [There’s a newspaper photo] of me and my mother in front of the Federal District Court in Brooklyn in 1985 after I won the IRS case. I am remembering her and my father with pride just as they were proud of me back then. Sent to the IRS April 18, 2017, with copies sent to U.S. Senator Mark Warner; U.S. Senator Tim Kaine; U.S. Representative Robert Goodlatte. As some recall I was taken to federal court in the 1980s for refusing to divulge my assets. With legal assistance I won that case due to a good judge and the Fifth amendment. I was prepared to go to jail then and I am now. But I guess I really don’t expect that to happen. Earlier this year I got a letter from the IRS saying they are going to start taking 15% out of my Social Security for my 2015 taxes (just a few thousand dollars). This is the first time they have ever seized from my Social Security. If they want to collect the $130,000 I owe them this year by taking 15% of my Social Security, I would say they will end up on the short end of the stick in the final analysis! My personal need for support in my WTR action is yet to be determined. It now appears that the IRS has settled into its normal pattern of multiple letters followed eventually by a Notice of Lien. I am determined to up the ante on a more significant government response by pressing my congressman Mr. Goodlatte as well as the IRS. Both of them have offices in downtown Lynchburg. I don’t want to let them quietly ignore me or process me routinely. I have had a delightful time redirecting my taxes! A filmmaker in Lynchburg heard about Larry’s redirection and is working on a documentary, The Pacifist, about Larry. You can learn more about that project and consider a donation to help defray the production costs, at facebook.com/thepacifistfilm.